so we would like to see cards for the men in your life. 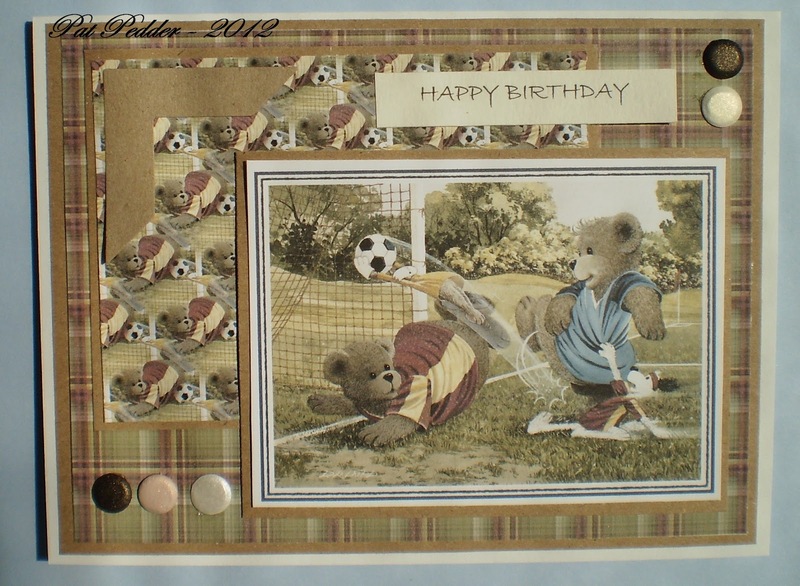 For my card I used an image and papers from the Boys to Men CD, used a Quickutz photo corner die and added some card candy and a computer generated sentiment. Do check out the challenge blog and see what the other Design Team Members have created. I've had a very busy week this week, emptying and refilling kitchen cupboards as we have had new work tops fitted and we are waiting for the tiler now to retile, I will be glad when that has been done as there has been so much dust. Anyway I decided that I would "chill out" today and make a card I followed the sketch on Lili's Little Fairies (can't remember the last time I used a sketch), the image is Summer Daydream by LOTV and the sentiment is also by LOTV, I coloured with Copics. The papers are by Papermania, flowers from Wild Orchid and the leaves cut with a Memory Box die. Do go along to the challenge blog and check out the great projects by all the Design Team. 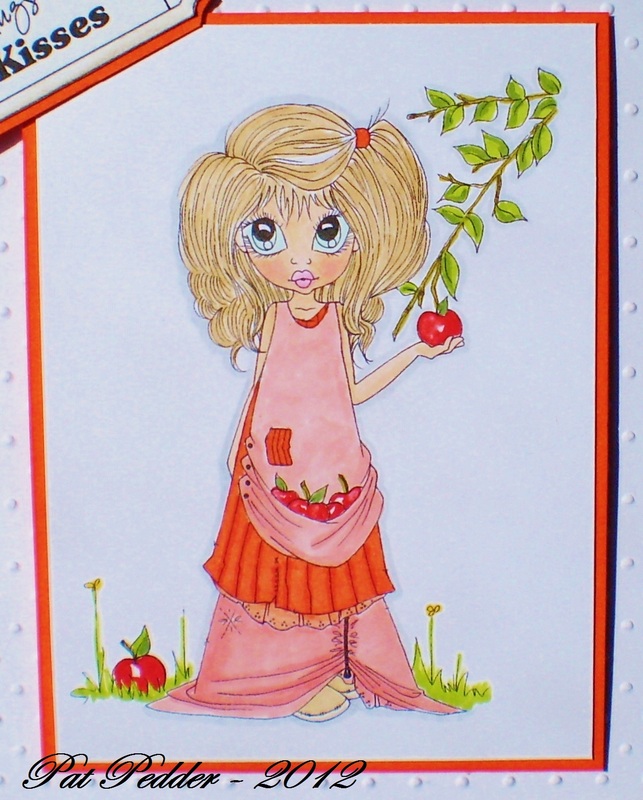 For my card I have used a set of Hero Art Stamps that I have had for years, I stamped the main image then stamped the watering can and cut it out, I coloured with Copics. The papers are from the Isabelle pad of First Edition and I finished with some buttons and string. Do you like making your own jewellery? My daughters new Website is now up and running, lots of gorgeous beads, bead mixes, lampwork beads, findings, charms, watch faces everything for your jewellery making needs and some items can be used in cardmaking. If you visit the site and add yourself to the mailing list you can get 50% off your first order, and UK p & p is only £1.90 per order. Offer closes on 31st May 2012. 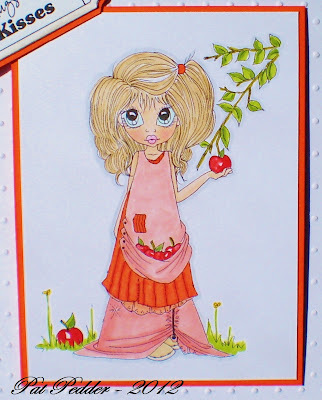 For my card I have chosen one of Saturated Canary images called Pricilla Pie, I think she is just gorgeous and I have coloured her with Copics. The papers are all from the Isabelle pad by First Edition, flowers are from Wild Orchid and the lovely silver charm corner is from the Hobby House. I added lace, pearls, Martha Stewart punch for the edge under the lace, and used a Marianne die on the foliage behind the flowers. 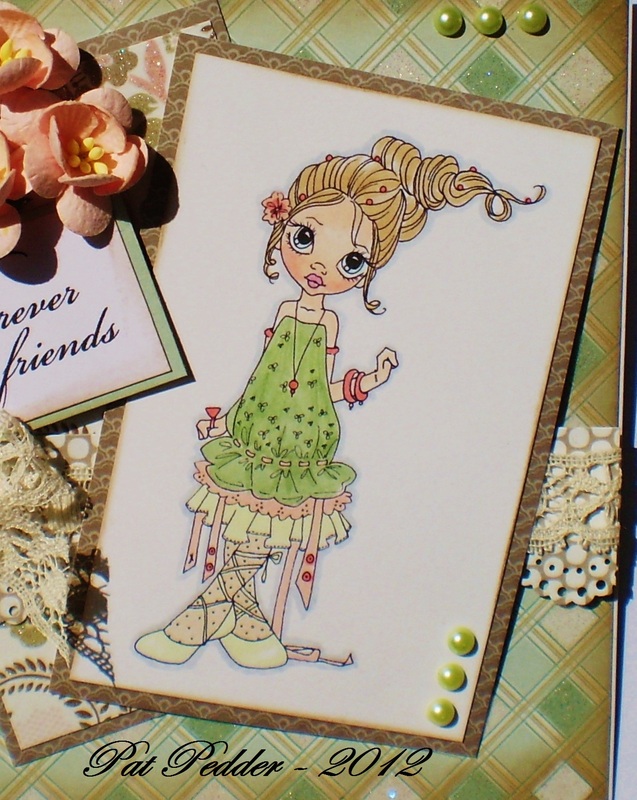 I finished with the lovely sentiment "Forever Friends" courtesy of this weeks sponsor "Digi Doodle Shop". 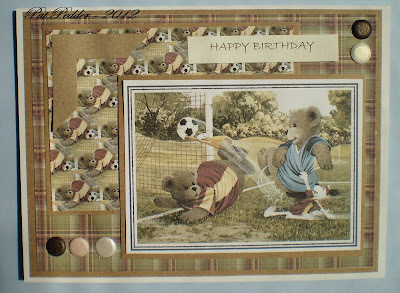 Do stop by the blog and see the wonderful creations by my teamies using some lovely images from our sponsor. It's time for a new challenge at Ooh La La and this week we would like to see your "Bold and Bright" projects. For my card to day I chose an image and papers from the Teentastic CD, unfortunately the photo doesn't show it up as bright as it is in real life. 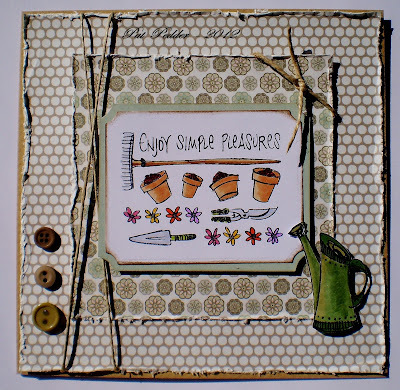 I added a leaf swirl cut with a Cheery Lyn die, some flowers, a butterfly, ribbon and computer geneated sentiment. Do pop along to the Challenge blog and take a look at what the other Design Team members have created from the beautiful Ooh La La CD's. I chose to use one of my LOTV Christmas stamps, as they are our sponsors this week. I coloured the image with Copics and added some glamour dust, the papers are from my stash and I cute the corner in gold glitter paper using a Memory Box die. 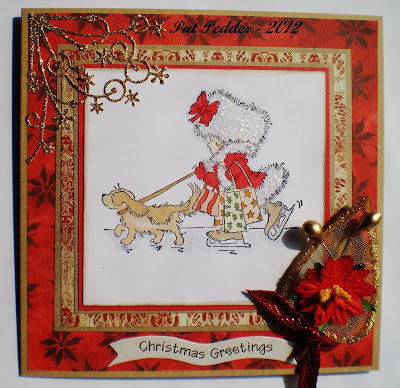 The embellishments were from my stash and I added a Christmas banner greeting. Do pop over to the challenge blog and check out the lovely projects by the DT and also from this week we are now listing our Top 3 as well as a challenge winner. Good Morning, Well I hope you all had a really good Easter, we, as a family, had a lovely time (though the weather could have been kinder), the girls all enjoyed their Easter eggs and being together. We have a lodger this week, eldest son and family have gone away for the week so we are looking after their dog, well puppy really as he is only nine months old, he is a lovely blue roan Cocker Soaniel and is very good though a little tying as he follows you around all day. 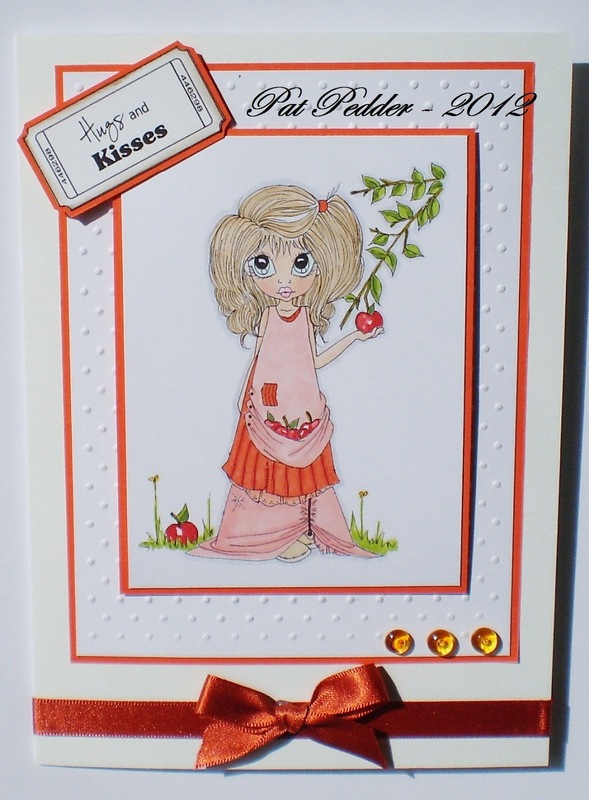 On to my card for today, it is my DT card for the challenge of "Fairy Nice" - let's see fairies on your creations - at "My Time to Craft". 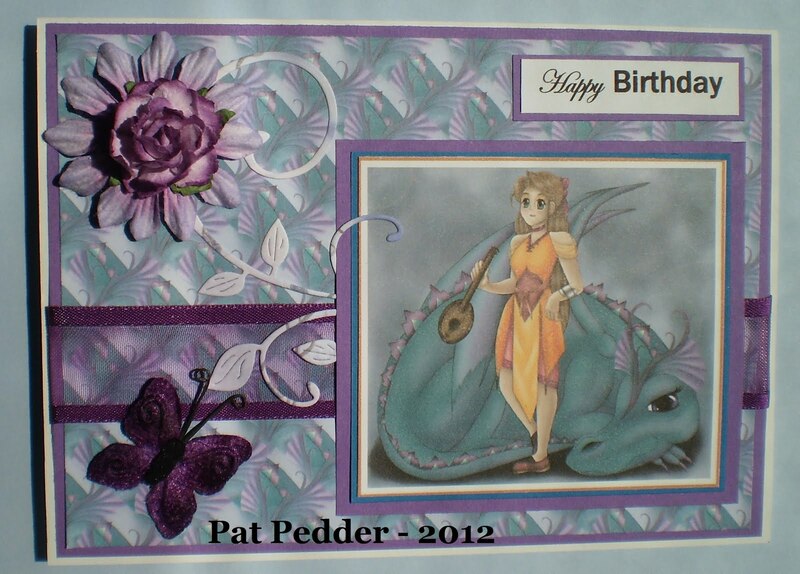 My image is by "LOTV" , I coloured her with Copics and added a little Stickles to the wings, the papers are Rayher and Dovecraft. 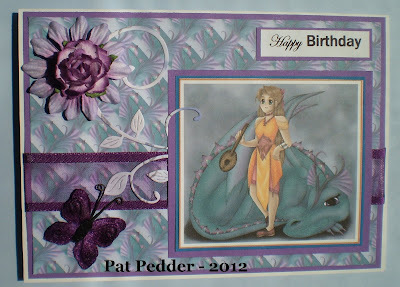 The ticket stamps I think was a free one some time ago, I added pearls, lace, flowers, punched branch and a fairy charm. I embossed some Bazzil card with a folder in my Cuttlebug and then sanded the embossing, the bp is by My Mind's Eye and Craft Creations. I added a flourish cut with a Memory Box die, some cotton lace, brads, small flowers and a computer generated sentiment. Do pop over to the challenge blog and check out the lovely creations by the Design Team members. Good Morning, Well we have had another lovely weekend, lots of sunshine though it has been a lot colder than last week but still very enjoyable, lets hope it continues for the next two weeks now the children are on Easter holidays. 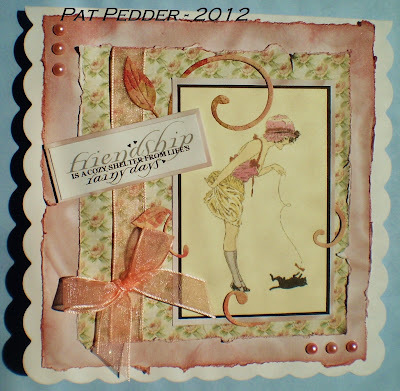 I have a DT card to share with you today made for our challenge at Ooh La La, where the challenge this week is "VINTAGE". 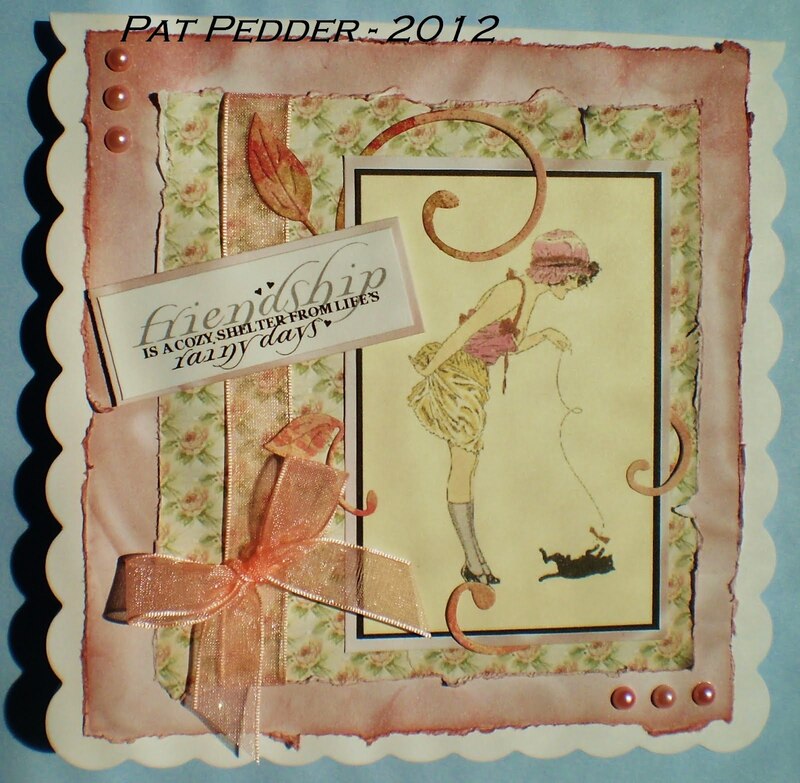 For my card I have used an image and papers from the "Passion for Fashion" CD, I distressed the paper edges and added some Victorian Velvet Distress Ink. The sentiment is courtesy of a friend, I used a Cheery Lyn die for the flourish and finished with some peach ribbon and pearls. 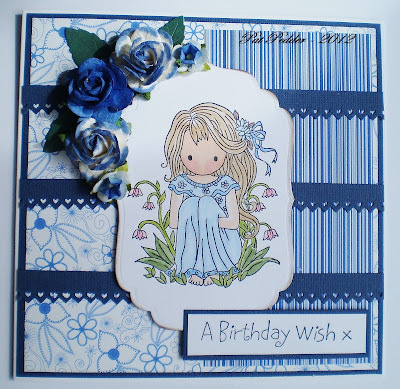 I love Vintage and hope you do to, if so why not pop over to the challenge blog and enter your Vintage cards this week, hope to see you there.